The PS4's share button is getting quite a lot of use for a feature that many claimed was "superfluous." 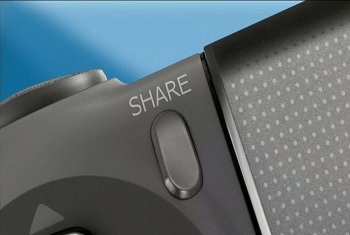 When the PS4 was first announced, one of the most-touted features of its new DualShock 4 controller was the "share" button. The share button would allow gamers to share movies and screenshots to various forms of social media at the literal push of a button. Many scoffed, calling the feature superfluous, and unnecessary. Sony has now released some figures detailing the button's usage, and it seems that despite its opposition, over ten million gamers have made use of the PS4's sharing feature. "Today, we're happy to announce that there have been nearly 800,000 gameplay broadcasts and more than 7.1 million spectate sessions via Twitch and Ustream. In total, that adds up to more than 20 million minutes of live gameplay streamed from PS4 systems across the globe." And this isn't just people accidentally hitting the button while they are using the touch-screen, as according to Ustream, each broadcast lasts for an average of 31 minutes. These are clearly deliberate broadcasts. Twitch also reports that 10% of all content broadcast via its platform since November 15 has come from PS4 systems. "PlayStation 4 is specifically designed so people can share their gaming experiences and interest in streaming live gameplay has surpassed our wildest expectations," said Shuhei Yoshida, President of Sony Computer Entertainment Worldwide Studios. "We're very excited to see gamers embrace live streaming from their PS4 system and we look forward to seeing how PlayStation gamers advance social gaming in the coming years." If the social media explosion this generation has taught us anything, it's that people like telling everyone, everything, all of the time. Sony has capitalized on this with the share button, and it looks like it's paying off.